Learn how to write an excellent explanation text. Planning tools, video tutorials, writing prompts and teaching ideas for English teachers, students and parents. 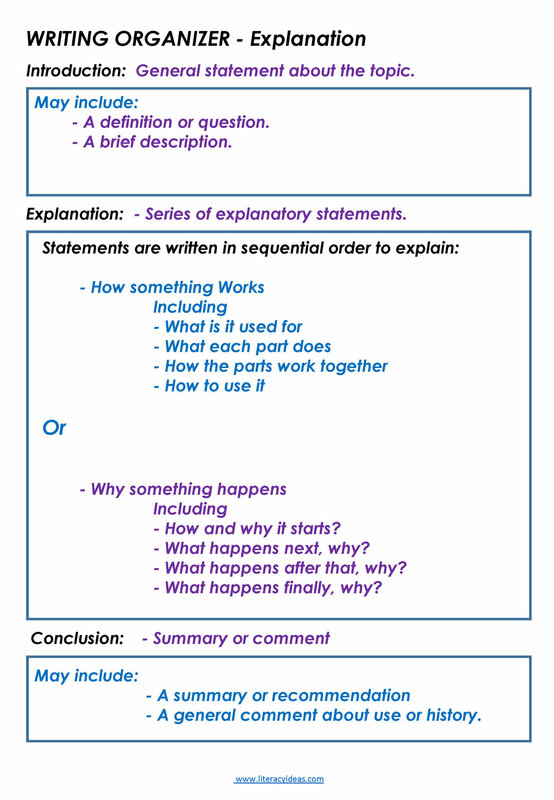 Welcome to our complete guide to writing an explanation text. This guide is intended for both teachers and students to make the process of writing fun, simple and straightforward. This page has plenty of great content and downloadable resources such as graphic organizers, prompts and much more. If you like what you see here be sure to check out all our other writing genre guides. An explanation text tells your audience how something works or why something happens. There are three types of explanations. Sequential – These detail the stages in an event eg: how a caterpillar turns into a moth. Causal - Details what causes the change from one stage to the next ie: How a president is elected. Theoretical - Details the possible phenomena behind a natural or created process that is not fully understood. eg What caused the Nazi's to lose World War II. Don't get confused between explanation texts and procedural texts. Why are our rain forests disappearing? The process of making aluminum. A procedural text is generally instructs how to make or do something such as recipe. Although they appear similar they are very different when compared side by side. Which identify the topic of your explanation. You may pose this as a question at the beginning with how? or why? Identifying the process to be explained. Emphasize the process rather than the particular thing involved in the process. Use sequential paragraphs or statements describing how or why something happens. Show connections such as cause and effect or temporal sequence. A strong concluding paragraph or sentence that draws everything together will add more validity to your explanation. Use graphic organizers, labelled diagrams and even videos you are constructing a digital text to illustrate your understanding. Talk about your topics in groups or as a collective rather than as individuals. Use language which link cause and effect. Use technical language and terms specific to your subject. Use technical descriptions to crate richer meaning. VIEW OUR PREMIUM 91 PAGE EXPLANATION WRITING UNIT: NO PREP REQUIRED! Using your writing time effectively is really crucial. When writing an explanation you will need to spend a significant period of time (Approximately 20 percent) researching your topic to ensure you know what you are talking about. Next take an equal amount ( 20 percent) of time to structure your writing using a graphic organizer or mind map which can be found below. If you follow this model you really only need to spend around 40 percent of your time writing. Your ideas and structure will already be formed. Well labelled images can save you a great deal of explaining. The use of technical terms such as evaporation, degradation if writing about the water cycle. What is it about? What are you explaining? Are you explaining how or why something happens or are you explaining a process. What are the important parts, section of what you want to explain? How would you describe it and its parts? Which parts need to be described as part of the explanation? How does it work? What happens first, next and and why? Assume your readers are not as knowledgeable on the topic as you are. This means you will have to briefly explain your topic before getting into the body. Use an intriguing title that will encourage the reader to continue, such as 'Why do spiders need eight legs?" Use correct scientific and technical terms. Find or create some labelled diagrams if possible. Use paragraphs effectively. Each new element of your explanation text should start with a new paragraph. Be sure to check out our own complete guide to writing perfect paragraphs here. Explanation texts are always written in present tense and from a third person perspective. You may offer some form of question or comment around your findings in the conclusion only. The rest of your report should be constructed purely of facts and evidence. If you use specific terminology you might need a glossary.